The Black Lives Matter movement, which came to national prominence in the wake of the 2014 police shooting of an unarmed black 18-year-old in Ferguson, Missouri, continues to gain attention following other incidents involving the deaths of black Americans during encounters with the police. A recent Pew Research Center survey conducted Feb. 29-May 8, 2016, found that general awareness of Black Lives Matter is widespread among black and white U.S. adults, but attitudes about the movement vary considerably between groups. 1 Roughly four-in-ten Americans support the Black Lives Matter movement. All told, 43% support the movement, including 18% who strongly support it. About one-in-five Americans (22%) oppose the movement, and a sizable share (30%) said they have not heard anything about the Black Lives Matter movement or did not offer an opinion. Support for Black Lives Matter is particularly high among blacks: 65% support the movement, including 41% who strongly support it; 12% of blacks say that they oppose the movement. 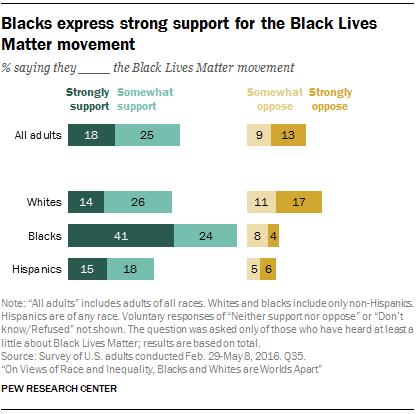 Among whites, 40% express support, while 28% say they oppose Black Lives Matter. 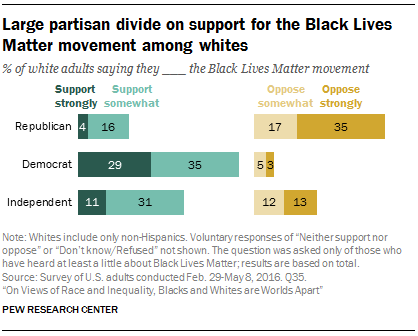 2 Among whites, Democrats and those younger than 30 are particularly supportive of Black Lives Matter. White Democrats are about as likely as blacks to express at least some support for the Black Lives Matter movement – about two-thirds (64%) do, compared with 42% of white independents and 20% of white Republicans. Among white adults younger than 30, six-in-ten say they support the Black Lives Matter movement at least somewhat. About half (46%) of whites ages 30 to 49, and even fewer among those ages 50 to 64 (37%) and those 65 and older (26%), express support for the movement. It is worth noting, however, that about three-in-ten whites ages 50 and older (28%) say they haven’t heard anything at all about Black Lives Matter. 3About a third of Americans familiar with Black Lives Matter say they don’t understand the goals of the movement. Roughly two-thirds (64%) of those who have heard at least a little about Black Lives Matter say they understand the movement’s goals very or fairly well. Still, about a third (36%) of those who have heard about Black Lives Matter say they don’t understand its goals too well – or at all. Blacks who have heard at least a little about Black Lives Matter are far more likely than whites who have some general awareness of the movement to say they understand its goals very well (42% vs. 16%). About four-in-ten whites who have heard of Black Lives Matter (38%) say they don’t understand the movement’s goals particularly well. 4 Blacks are more likely than whites to say the Black Lives Matter movement will be effective in the long run. About six-in-ten blacks (59%) believe that Black Lives Matter will ultimately be effective in bringing about racial equality. 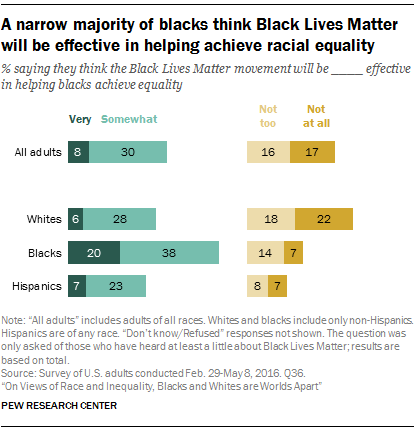 Whites are about evenly divided: 34% say the Black Lives Matter movement will be effective in helping blacks achieve equality, while 39% say the movement won’t be effective; another 26% either weren’t familiar with the movement or didn’t provide an opinion. Among blacks, skepticism about the effectiveness of Black Lives Matter may reflect broader skepticism about the future of racial equality in the U.S. Our survey found that fully 43% of blacks doubt that the U.S. will ever make the changes needed for blacks to have equal rights with whites. Some 11% of whites feel this way.